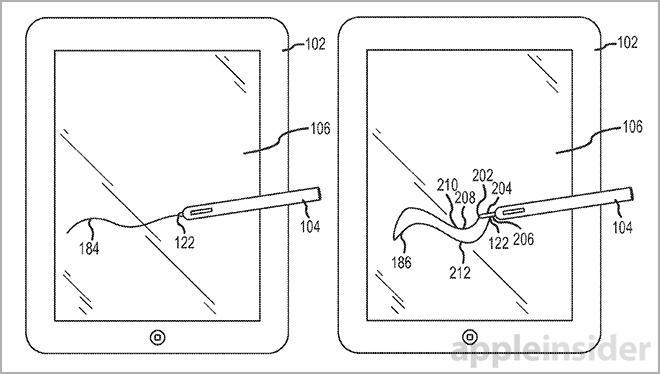 Apple has shown interest in building a new intelligent, sensor-laden stylus that could draw lines of varying widths and shapes by extending a long, extendable "nib" that interacts with a multitouch display. Apple's "Input device having extendable nib" describes a unique stylus with a number of different nib or tip configurations, each having its own properties for drawing on a multitouch surface like an iPad. Published by the U.S. Patent and Trademark Office on Thursday, the proposed invention also boasts on-board sensors for motion detection and a light sensor for sampling real-world colors. Unlike current styli, Apple's invention notes that the conductive nib may have variable interaction surface dimensions dictated by length. For example, a nib can have a limited interaction surface when set to a position close to the stylus chassis for drawing thin lines. By extending the nib outside of the stylus' body, it will be able to interact with a screen at more than one touch node. In one embodiment, the nib is flexible, meaning the further it extends away from the chassis, the less rigid it becomes. This can be useful in delivering multiple "feels," like a pen or paintbrush. The more a nib is exposed, the more nodes it can touch on its "sides." In such scenarios when the stylus activates more than one touch node on a multitouch screen, a different input may be registered with the tablet's GUI. A basic example is a resulting thicker line, though the input's formatting can also change, making changes like output color, opacity and more. 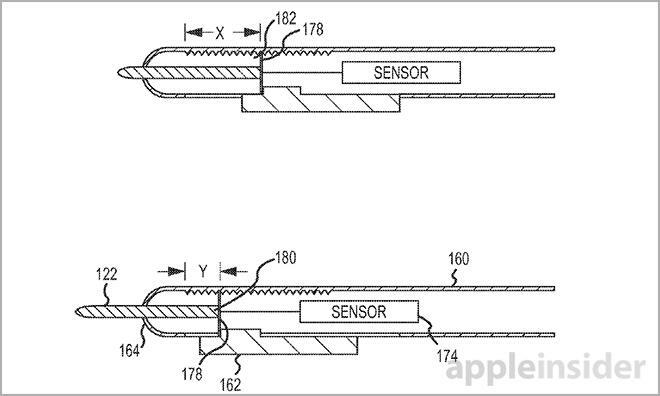 Moving to the nib itself, Apple envisions the piece to be made out of a conductive material like metal, doped rubber or mylar. The main function of the part is to be at least partially flexible so as to allow for slight deformation when writing or drawing. When a user wishes to extend the nib out of the stylus body, they can use an actuator or switch mechanism integrated within the chassis. For example, a slider, button or twist cap can extend or retract the flexible nib. The actuator is especially important in embodiments that include multiple tips, or strands as Apple refers to them. These strands can be extended just as the usual one-piece nib, but may in some cases "fan out" to create a brush effect. Because the filaments extend out of a single hole, the stylus may include a special collar system that changes the shape of the exit aperture. In one example, a thin slit is selected, thus forcing the strands to fan out. Other examples include a shape that forms the nib sections into a round brush. In one embodiment, the system features light-transmissive nibs or strands through which data may pass to the touch screen or a processor on board the stylus. In this case, the touchscreen display may have cameras embedded beneath its surface to collect light information pumped out from an LED in the stylus. Communicating via light, the stylus would be able to inform the tablet to change a line's color, engage certain patterns, change brush types and even operate system functions. Alternatively, the light sensor may be connected to the nib or a strand element to read light information from the display. This would allow for a number of different functions, including screen color calibration and sampling of hues from the real world that can then be applied to a digital painting, among others. Finally, in some forms, the stylus may be kitted with a sensor suite including accelerometers, gyroscopes and other motion-sensing components that relays stylus position and angle back to host tablet. The array would be helpful in transmitting lean angle that may then output a wider stroke, mimicking the motion of a wide-tipped pen. 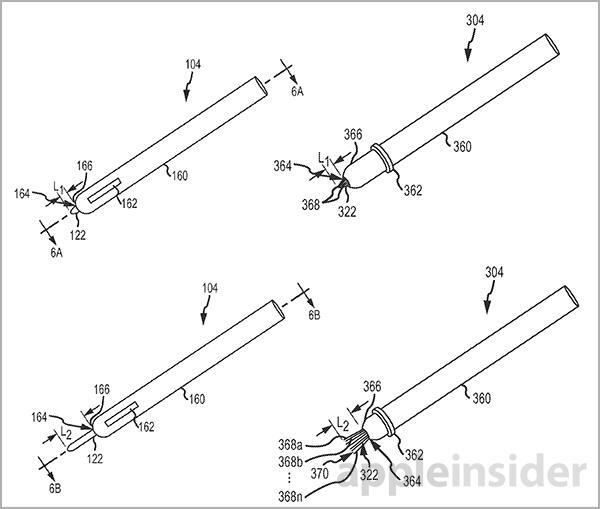 Apple's advanced stylus patent application was first filed for in 2012 and credits Joel S. Armstrong-Muntner as its inventor.